Your choice of contractor has the potential to make or break your project. Make sure you choose an experienced contractor like Cabinet Magic for your Kitchen remodeling in Tustin CA. At Cabinet Magic, we have over 30 years of experience in cabinet fabrication and remodeling. We know exactly how to get you the high quality products you need and manage all the moving pieces of the project so that the work gets done on time, on budget, and with superior quality craftsmanship. 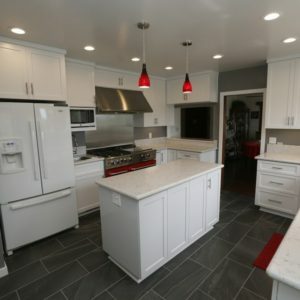 Going for a bold new look with kitchen remodeling in Tustin CA can be exhilarating. But you may also feel a little bit worried. For example, you may worry that your flooring and countertop won’t complement one another like you’d hoped, or that the color you’ve chosen for your cabinets will be too dark once a whole wall of cabinetry is installed. At Cabinet Magic as your contractor, you’ll never get left in suspense regarding how your kitchen remodeling in Tustin CA will turn out. We know you want to feel confident of what you’re getting before you entrust us with the project. That’s why we offer 3D computer rendering services on every remodeling project. We’re happy to create multiple versions of the design so you can easily compare different options. We never begin work without your sign off and approval of every detail of the design. Most people opt for custom cabinetry because they want a truly unique look with cabinets perfectly suited to their style and their space. But custom cabinetry also delivers another very important benefit: custom functionality. You can trust Cabinet Magic with your custom cabinetry because we have nearly 3 decades of experience in this specialty service. No decorative detail or cabinet accessory is too difficult for our talented craftsmen. We take pride in our exceptional craftsmanship and we are confident our cabinets will last for decades. Take the first step towards beginning your kitchen remodeling in Tustin CA today by contacting Cabinet Magic at 800-828-4380 and requesting your free in home consultation. We’ll be happy to share ideas and provide a free estimate for the project.